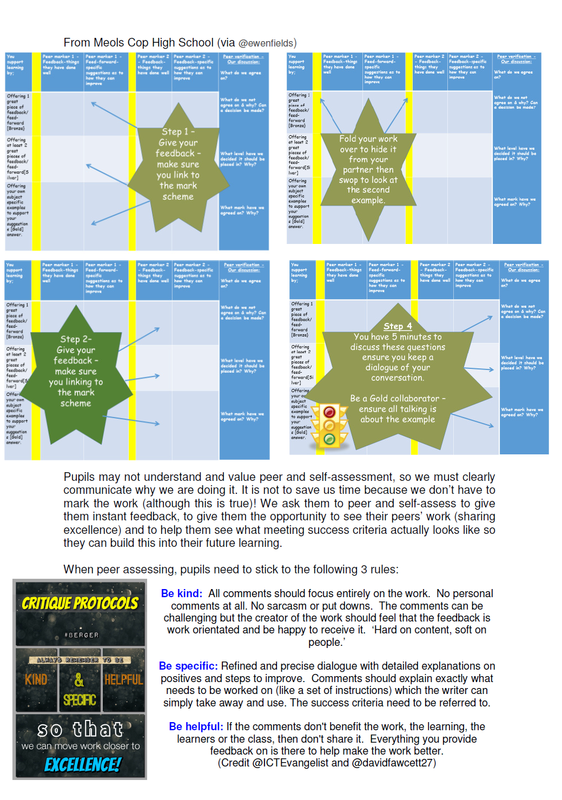 This month has seen the launch of the new Marking, Feedback and “Closing the Gap” policy at our school. 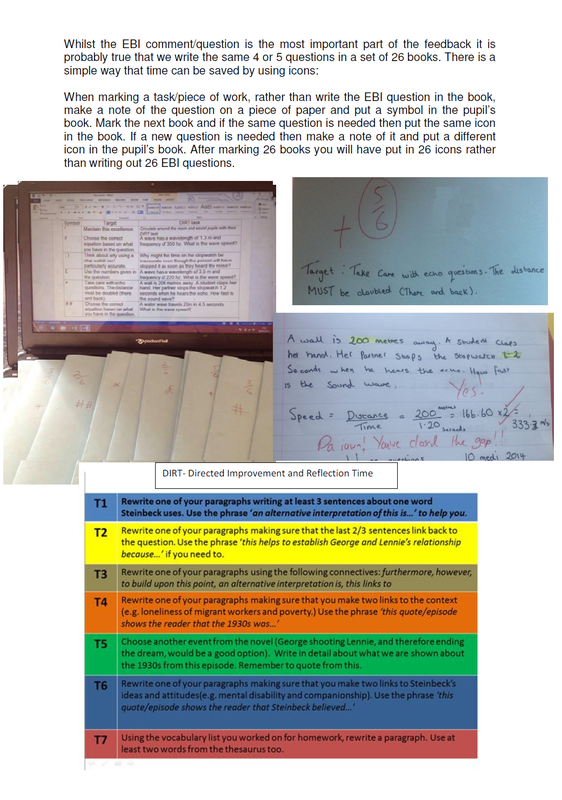 Our feedback policy has been due to be updated since Estyn (in a very positive inspection) noted that the consistency of written feedback needed to be, well, more consistent. 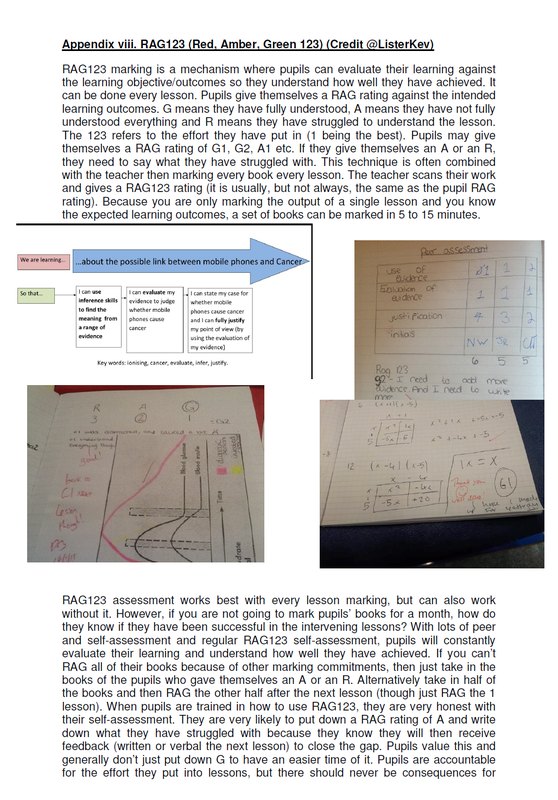 Creating a new policy has been high on the school’s agenda but I have always had my concerns as to whether a consistent, whole school approach to marking was possible or even desirable across a range of subjects where marking would look so different. 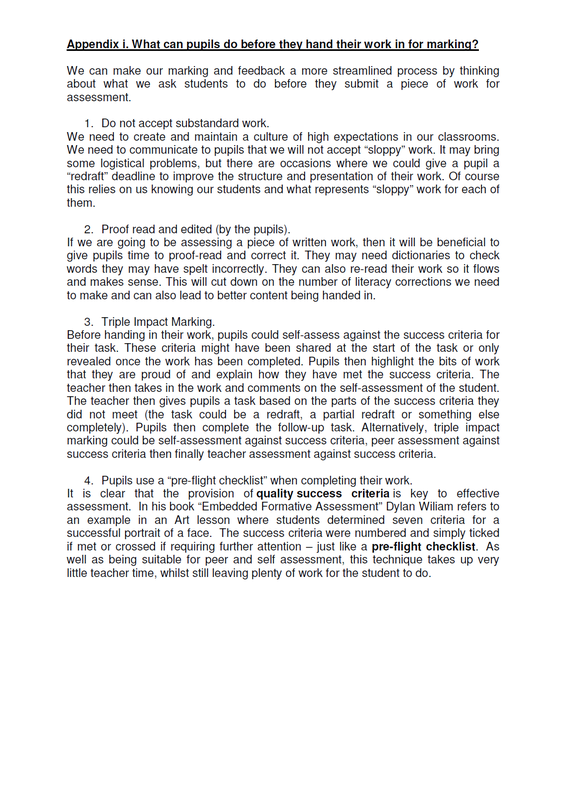 Reading this blog by Tom Sherrington (@headguruteacher) was a turning point in realising what sort of whole school policy we should be developing. In the blog, Tom describes the “closing the gap policy” : I thought this was fantastic. 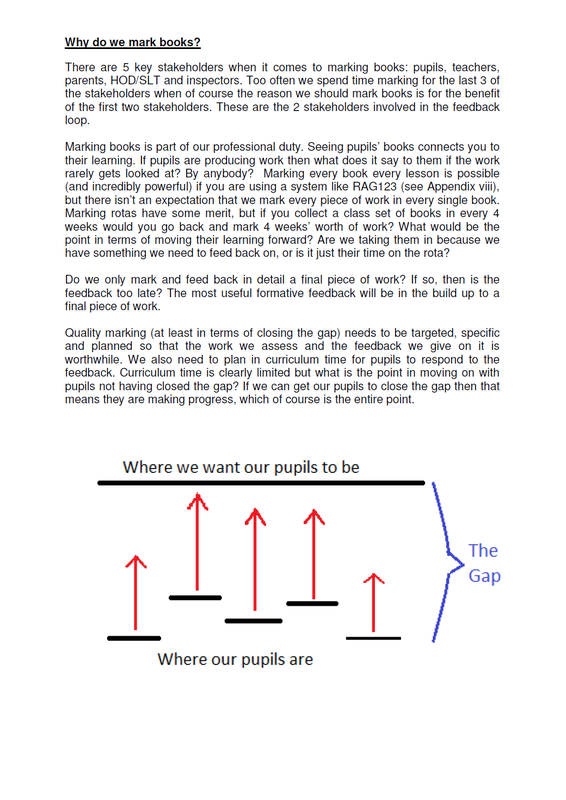 When you think about it, it does seem obvious that the whole purpose of formative assessment (in terms of marking books) is to identify “learning gaps”, give feedback to the pupils and then (crucially) for the pupils to act on the feedback to close the gap. This idea, along with evidence of why feedback matters, is articulated in this excellent blog by @shaun_allison. 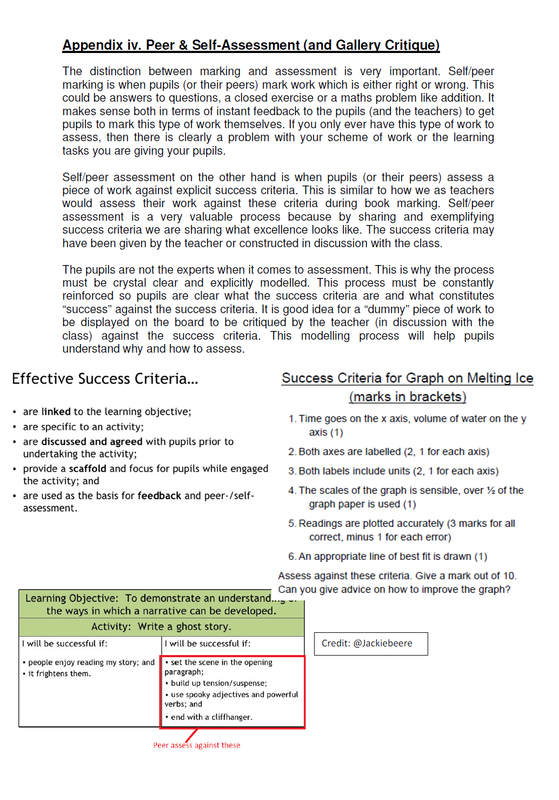 There is no single and correct way to give “closing the gap” feedback and it will probably look very different in subjects as diverse as ICT, History and Maths, However, even if the feedback looks very different in each subject area, if we can give feedback which pupils act on to close the gap, we have our consistency. More than that, we will improve the knowledge/skills/performance of our pupils which is, of course the whole point. The working party put the finishing touches to the policy and it was launched in January of this year. The challenge for HODs is to develop their own “closing the gap” policy which works for the students in their subject. This will then be launched in September with an INSET morning later in the year booked in for departments to share their “closing the gap” strategies and better share best practice in their area. The policy is nothing more than a set of principles. Deparatments need to tweak/change their marking policy so it adheres to the principles. The golden thread is this idea of “closing the gap”. This is our policy in its entirety (although the Literacy marking appendix section is not included as we are working on a cluster wide set of symbols): So there it is. 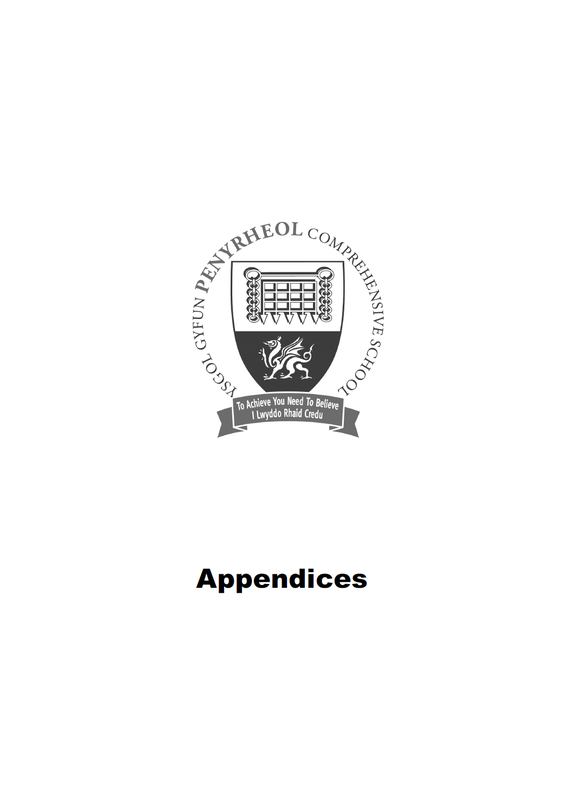 The academic year of 2015-16 promises to be an exciting time at school as we develop and refine the principle of closing the gap. 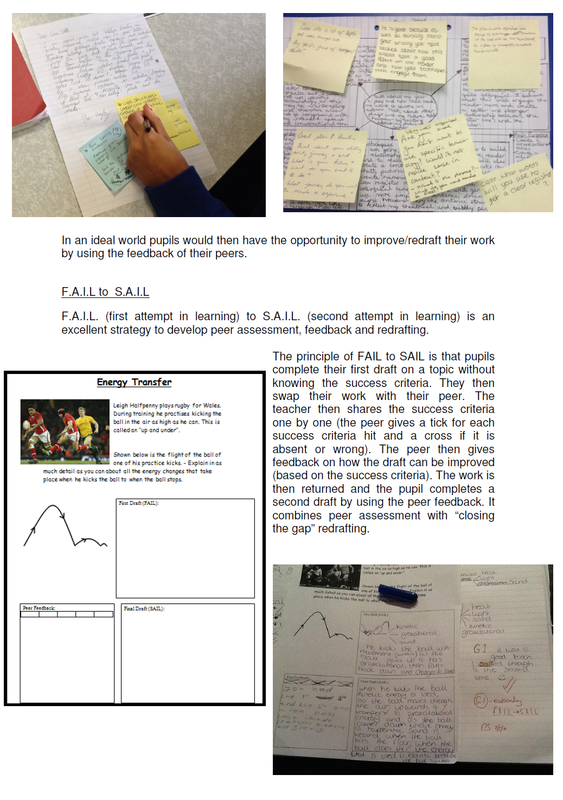 The aim is that acting on feedback becomes the absolute norm for all of our students in every subject. If you would like to download the document click here. My headteacher is very pleased with the finished article and if all teachers in all departments can get our pupils to “close the gap” this can only help to raise standards. One possible bone of contention is that closing the gap by pupils requires some curriculum time. Time, like any resource is finite. 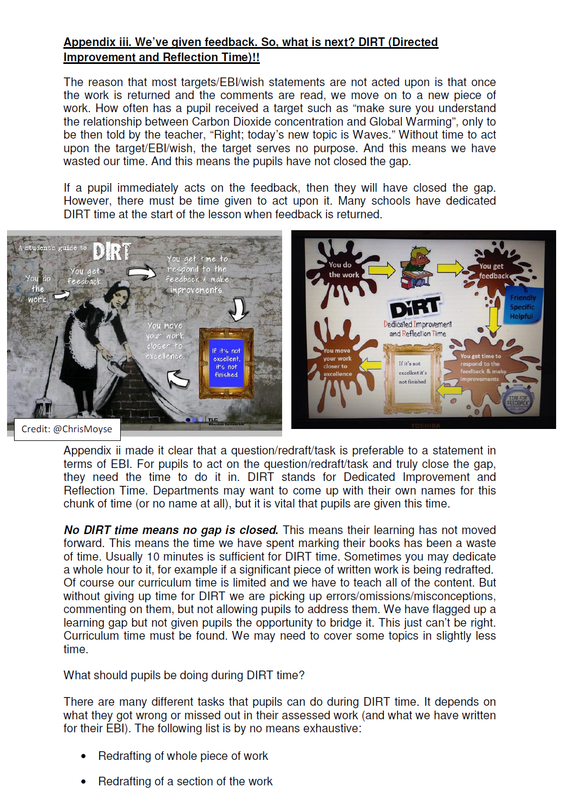 It is not always easy to find this time for pupils to close the gap. However, what is the alternative? The alternative is that we mark books, we identify misconceptions and learning gaps, but then we just plough on regardless. This is clearly nonsensical. When I asked my headteacher if I could share this resource he told me that we are always happy to share at Penyrheol and besides, most of the ideas have come from other people…………(very funny and very true) On that note, these are just some of the blogs that helped shape this policy and are ideal further reading: Fast Feedback by @dan_brinton Feedback Matters by @shaun_allison Adventures with Gallery Critique by @atharby Feedback on Feedback by @ewenfields Can I be that little bit better at…..making feedback stick? 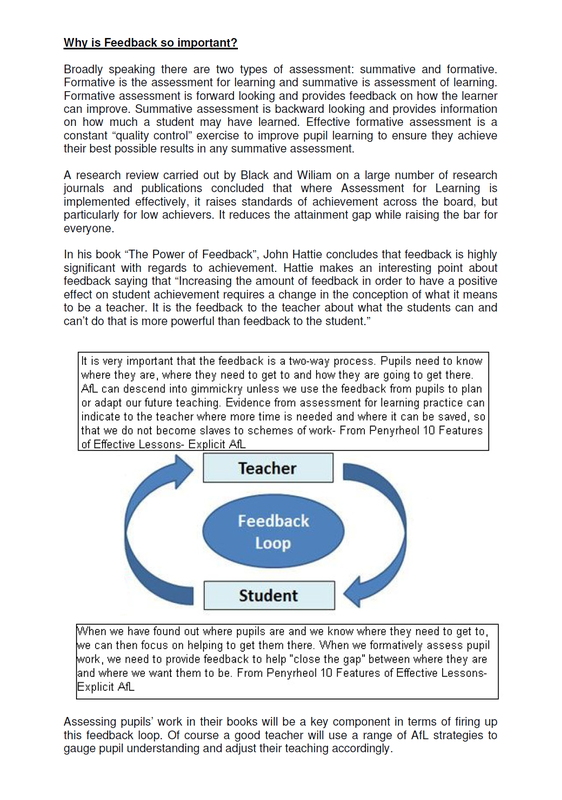 by @davidfawcett27 Have we got Feedback backwards? 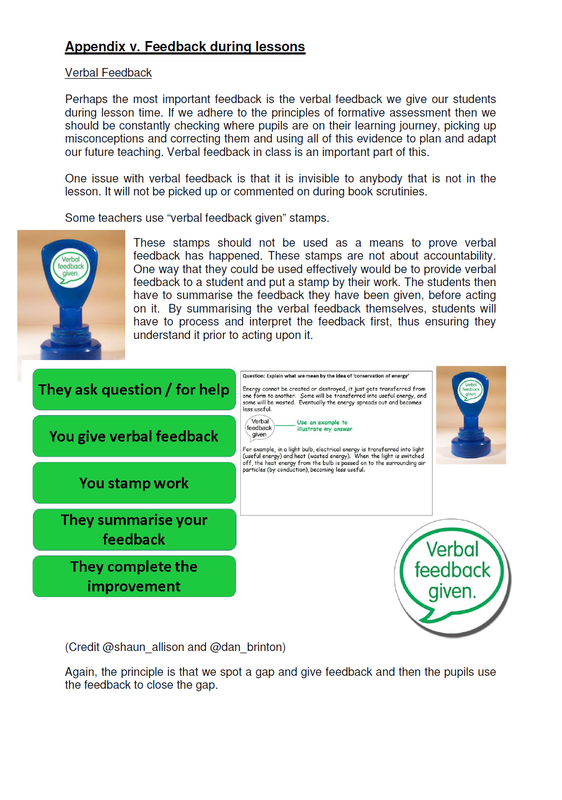 by @HuntingEnglish RAG to clean up marking and Giving summative tests formative impact by @ListerKev Closing the gap marking – twilight CPD by @chrishildrew More on marking by @MaryMyatt What if feedback wasn’t all it is cracked up to be? 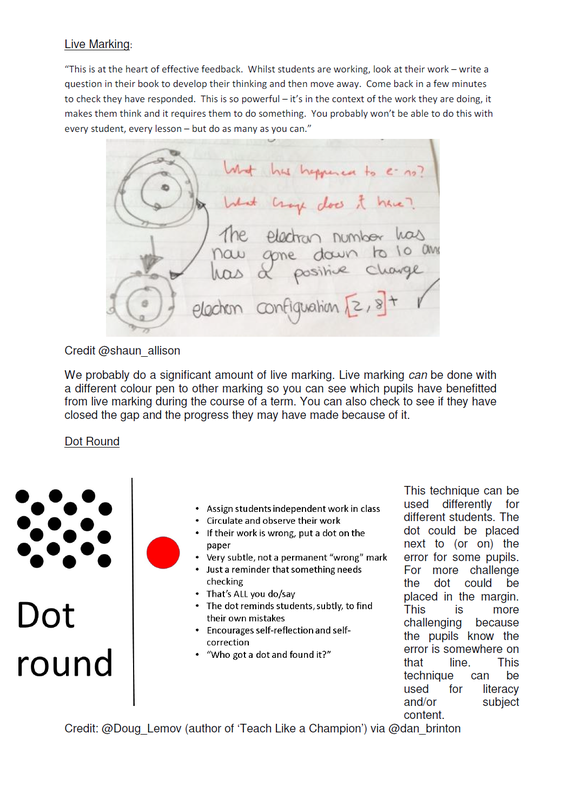 by @Andyphilipday Abandonment and enhancement-assessment and expected learning gains by @LeadingLearner Taking a look at books by @TeacherToolkit (where I will certainly be “borrowing” some monitoring ideas) Feedback Archives by @LearningSpy Has anyone tried a “dot round”? 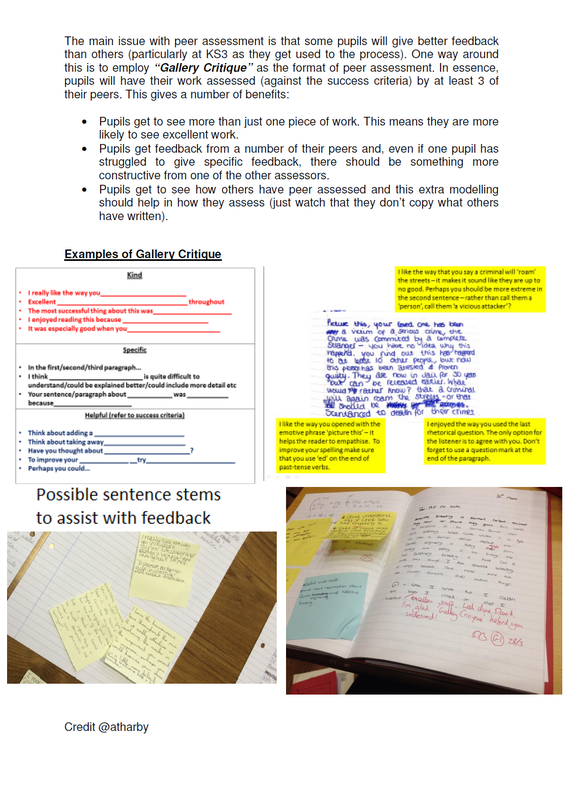 by @Doug_Lemov (and TLAC2 is a must buy btw) Moving from marking to feedback by @HFletcherWood Back to Marking by @ChrisChivers2 As always, feedback is welcome (and of course I will aim to act on the feedback). 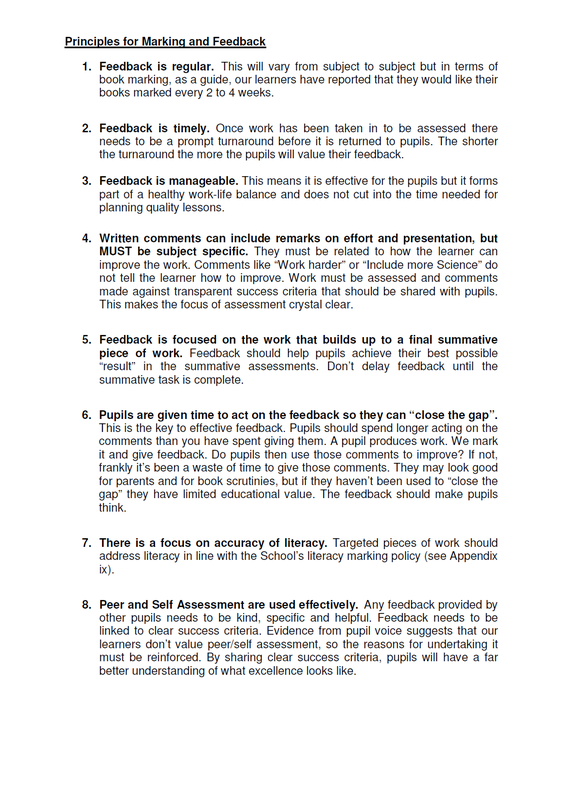 Further Reading update: here is the Whole School Feedback Policy from Huntington School shared by @HuntingEnglish. Hi. Great digest of current thinking on this. Thank you for sharing and thanks to your Head. I’d be interested to hear how you propose to now ensure that these principles are found both in department policies and in everyday practice. Are all the HoDs on board? What consistencies do you hope to find in department level policies? When you scrutinise policies, what exactly will you be looking for beyond ‘something to do with DIRT/CtG’? How do you distinguish here between what is a description of best practices, and what is policy? 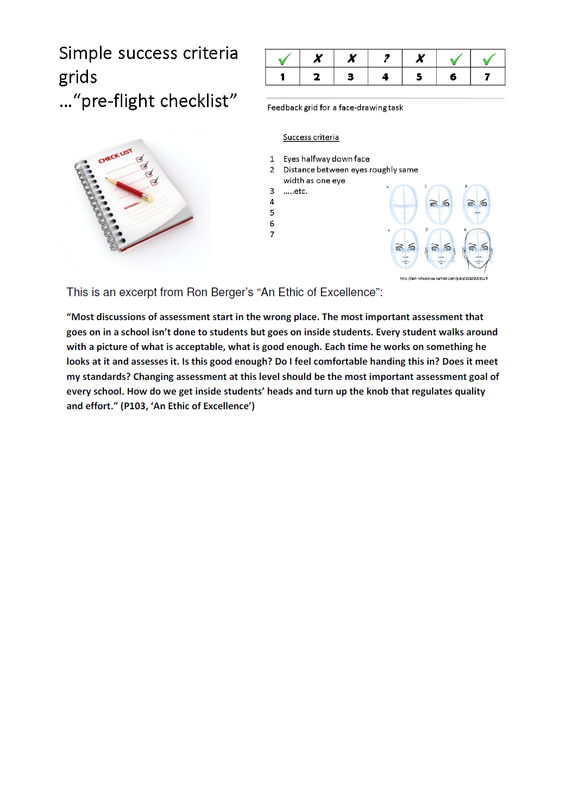 I ask the questions because I am currently writing an assessment policy and am very much interested in the implementation of these things. Hi John, many thanks for taking the time to read and comment. You’ve clearly asked some very important questions. If nothing else it certainly highlights that the hard work starts now. I’m not 100% sure that all HODs are fully on board at the moment. This is partly because it seems both new and a big change and the other reason is that some departments are loathe to give up any more curriculum time. However, when we all have time to reflect it is clear that the idea of closing the gap is nothing new; in a sense it is the basic unit of teaching. It is my job to communicate to all departments about how much curriculum time is needed to “close the gap” and how this is a vital part of the learning journey. It may mean that SOW need to delivered in a slightly shorter period of time. This may not sound ideal but the alternative is that we have snowplough schemes of work where we plough on regardless of whether pupils have misconceptions or not. We have an inset earmarked in the next academic year where departments will share their closing the gap strategies. I am hoping that peer feedback will lead to refinements and improvements in what each department does. When I scrutinise policies I obviously expect to see DIRT/CtG in there. I will then expect to see these strategies in evidence in book scrutinies. 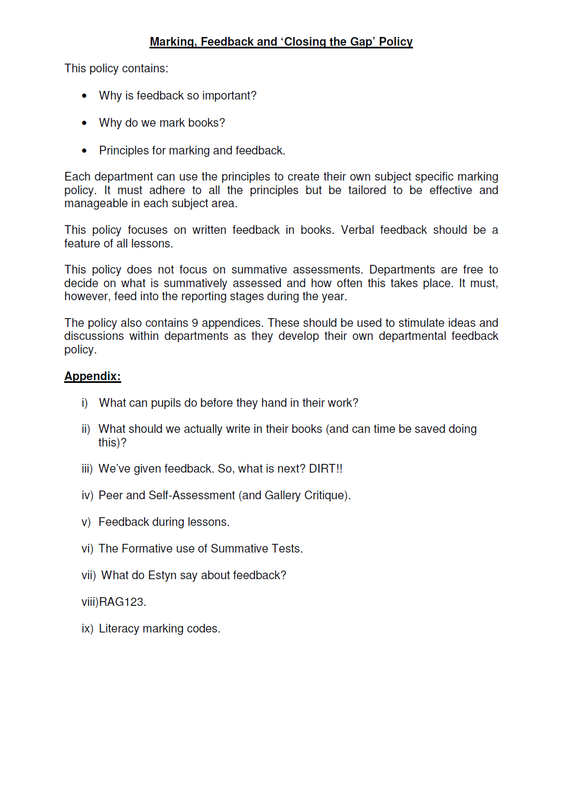 I will be interviewing pupils to see if what is written in the policy is happening following assessments. I will share the questions I will be asking the pupils with HODs well in advance. I want to make the process as transparent as possible and avoid any idea that I am trying to catch out departments. Assessment will be a recurring departmental agenda item and I envisage it being at least 12 months before we are in a position that all departments are closing the gap in an efficient and genuinely useful manner. We need to maximise the opportunities where we share our best practice. Great collection of policy, practice and ideas for all schools and teachers to use. Although, I’m really not keen on VF stamps. What is the purpose of them? 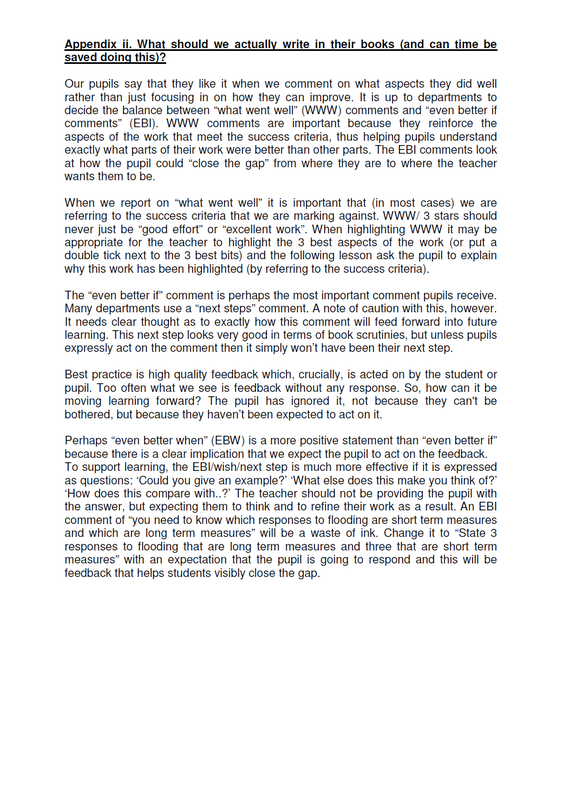 To evidence to observers that some form of feedback has taken place? Impossible to always record and monitor verbal feedback surely? Damian I just want to firstly say thank you for sharing. 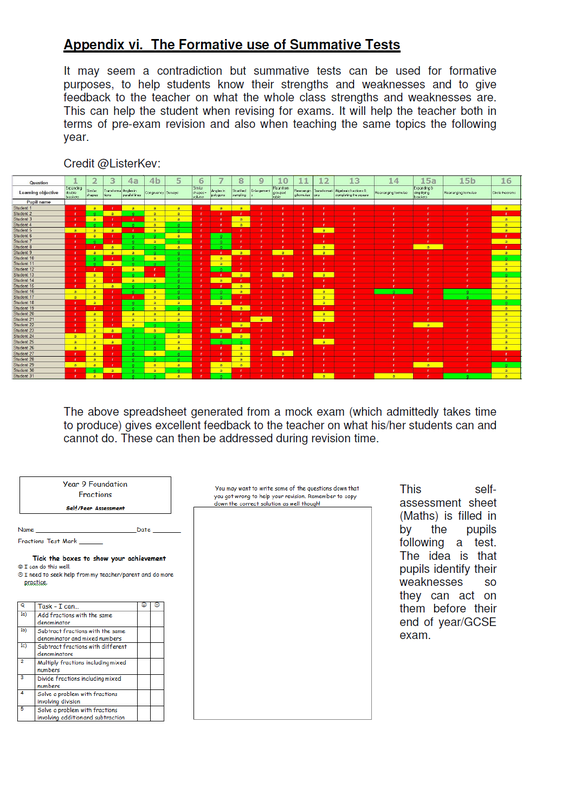 If it helps we have a feedback policy and DIRT time – closing the gap marking has been a focus for us nearly 2 years. It has been hard work getting people on board and even now some members of staff still need support or a nudge but it does pay off! 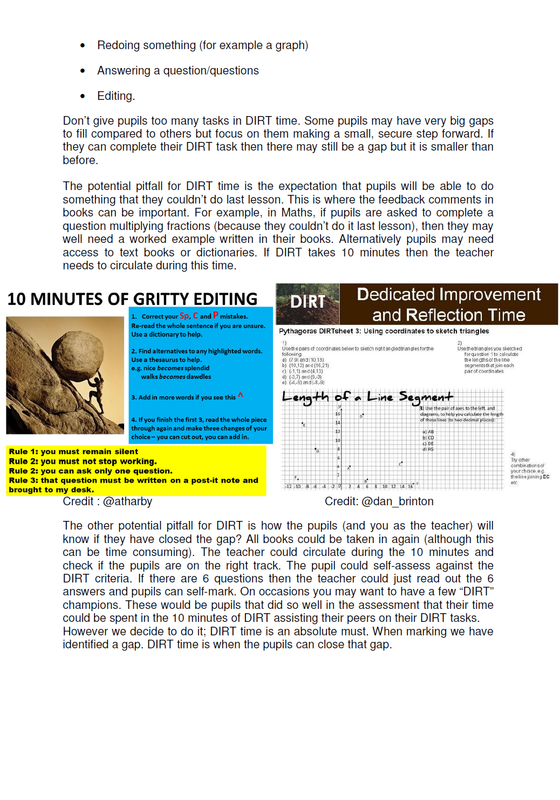 The booklet is fantastic, as AHT for T&L I have dedicated weeks to DIRT time (DIRT DAYS) this almost in some instances ‘forces’ staff to have a focus on this, especially those who need a slight nudge but in fairness everyone is doing it and the vast majority doing it well (when I drop in a share all the best practice I see too which is great). We also ensure that every child closes the gap in the same colour which makes it so much easier to identify where they have gone back and amended work, checked spellings etc. Good Luck with your journey on this and thank you again for sharing!